If you were to ask someone in the real estate industry what effective search engine optimization looks like, they’d likely explain by example. The example they’d most likely give is “ranking high on search engines for “_______ homes for sale” where the blank is the city or state where they do business. But not as right as they could be. It turns out that there is a significant difference between those two perspectives, and that difference is generally referred to as the Long Tail. The long tail of real estate searches consists of terms that are more obscure than “_______ homes for sale”; precise terms by motivated buyers and sellers. Tomorrow, if this broker lost all of the traffic they currently receive from those 100 search terms, they’d lose only 25% of their search traffic. That’s because the other 75% of their search traffic comes from with only a handful of visits per month to only one visit. Obsessing over rankings for a single popular term has merit, but raising the bar for thousands of terms will have a larger impact on your website’s traffic. How long is the long tail? For the broker listed above, the full graph of search terms over the past month would be 175X wider if every term that produced traffic was listed. 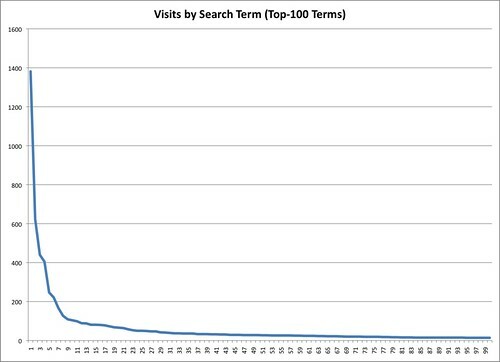 At that graph’s current scale, it would need to be around 70 feet long to account for every unique search phrase that brought in at least one visitor over the past month. More precise terms are also often used by motivated buyers. For example, a person typing in “Minneapolis Homes for Sale” is probably going to work their way through neighborhood research before narrowing down to homes matching her lifestyle and financial criteria. While it’s great to show up for terms that broad, the conversion rate from more precise terms further down the long tail is considerably higher. SEOmoz Whiteboard Friday – Ignore the Tail at Your Peril! from Scott Willoughby on Vimeo. Here’s an interesting nugget about SEOmoz: They work with Zillow, who does a great job making sure they show up on on long tail searches. When Rand says, “Ignore the Long Tail at Your Own Peril,” he could very well be referring to real estate brokers around the country who do just that. In fact, Zillow and Trulia’s success is largely built on their ability to sweep up valuable long tail search engine traffic that brokers continue to ignore. Thanks for this post – and the link! I really enjoyed the video and was not familiar with Vimeo. It looks like a great resource I will be visiting to learn more about SEO!